Tropical islands are meant to serve one purpose: to entertain the tourists that are tired of their daily lives. Lying under the sun, walking around on the beaches and swimming in the crystal clear water seems like the perfect remedy for a hard year. Gili Layar, the island we’re reviewing in this article, is perfect for that. Located in south-eastern Lombok, it is equally suited for the loners, the newlyweds, the couples, and the older men and women that are looking for a nice and quiet spot where they can “refuel their engines”, so to speak. You might already know that there are 30+ Gilis in Lombok, and they all have something unique to offer to the foreigners. So, what’s so special about this one? Is it any better than Trawangan, Sulat, Sudak, or any of the other islands in the area? Well, no, it’s not better, but that’s not the point. Gili Layar is a beautiful tiny piece of land where you can swim with the little ones, dive a bit deeper to admire the underwater life and try your luck in some beach games like volleyball or football. The atmosphere there is amazing, just right for letting your mind, heart, and soul rest. 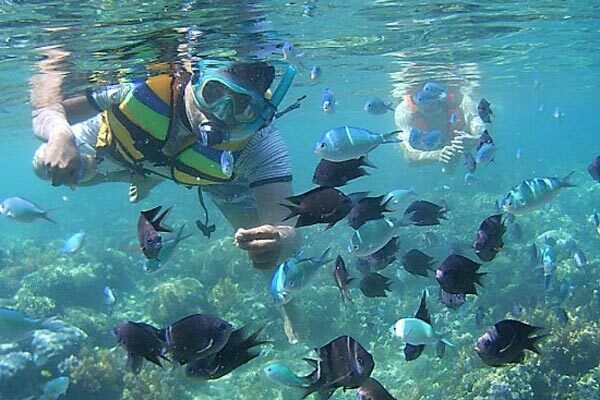 The coral reefs are one of the best ones in Lombok; the fish there is very diverse and includes several exotic species that the fans of marine creatures will definitely like to capture on their phones/cameras. What Is Gili Layar All About? Interesting fact: when visiting foreign islands, people don’t usually have a clear “schedule” of what they are about to do there. All they dream about is having a good time. And while you can do the same in Gili Layar, it would be wise to jot down at least some ideas/wishes while on the flight to Lombok. The first thing you should do is get yourself comfortable. The umbrellas on the beaches will be great for that. If you feel energized and excited, try climbing some of the hills. Don’t worry – they’re not very steep, but will, without a doubt, offer some great views over the island and the surrounding areas. Gili Layar is also famous for the turquoise water and the fish – I mentioned that earlier. Put the snorkeling equipment on and dive into an entirely different world full of amazing creatures. You won’t even have to swim underwater for long, as the local fish don’t seem to be afraid of the humans and hang around very close to this spot. The experts claim that along with Petagan, this is one of the best Gilis for snorkeling and taking selfies. Layar is a mini-island, if you will, meaning there isn’t that much space to drive around (motorized vehicles aren’t allowed, by the way). Still, there’s enough ground in Gili Layar for some romantic walks along the beach with your significant other. Late evenings and early mornings will be the best times for that. The best fact about this place is that it’s still in a “virgin” state. I’m not saying it hasn’t been touched by the humans here and there, but most of nature is still intact and looks the same as many centuries ago. The white sand is everywhere, and you won’t find any concrete on the island. There isn’t any trash lying around, except for the times when the tides are high and the currents are strong (during the wet season). Have you ever heard the expression – a sight for sore eyes? That’s exactly what Gili Layar is, especially if you’ve never been to a tropical island before. It might not be the fanciest Gili in the area but sure does have a nice touch to it. Ok and what about its neighbors? Are they any good? They are pretty awesome, actually. Overall, there are five island in close proximity plus a bunch of other ones further to the east. And while Anyaran and Rengit are mostly uninhabited and not known to the tourists, Asahan and Gede are quite alright. Note: there are some bungalows in Gili Layar, which means you won’t need to sail around to get food and drinks. They come with public bathrooms and might even be able to sell you dry towels, some hats, and mosquito repellent for a comfortable time on the beach. However, that’s not nearly enough for the esthetes. Say, in Gede, you’ll find a series of amazing cafes and restaurants right on the beach, waiting for you to enjoy both the food and the view. And, there are a lot more accommodation options there. Asahan does not provide as big of a choice but is still better in that regard than Gili Layar. So, consider your options and don’t let the bungalow owners make you pay more than you necessarily have to. Again, on a speedboat, it won’t be a problem to sail between these beautiful islands. In fact, most tourists use their time on the water to check out the south-western coast of Lombok from afar and take selfies in the middle of the sea. If you move a bit further to the west, you’ll reach Desert Point. It is one of the most popular spots for the surfers from all around the globe. The distance between these two destinations isn’t big – you’ll get there in 30-40 minutes tops. But that doesn’t mean you won’t have fun on Gili Layar. On the contrary: to get away from the men and women with surfboards and the noisy restaurants, it will be the right choice. At the same time, it’s easier to get bored on a tropical island than you might think, and that is exactly why I’m encouraging you to make the most out of the area you’re at right not. Gili Layar’s lush, beautiful forest, clear beaches with white sand, the breath-taking views, and the fish will keep you occupied for quite some time. The sunsets are beautiful; the food they serve is delicious (but could be a bit pricey compared to other spots in Lombok); the people are nice and friendly. As soon as you step foot on this island, you’ll instantly see that it’s very well taken care of. I already told you to have some sort of a plan and to switch between the various Gilis for a maximum effect from the trip. Right now, Layar is like a paradise for the chosen ones; but once the rest of the world learns about its worth, you’ll see more and more foreigners crowding it. Just remember that the jellyfish has a nasty “bite”, the mosquitos like to bite, and the boat owners will probably try to fraud you. If you want to get Gili Layar all to yourself, make sure not to go there during the Indonesian holidays, because that’s when it will be full of locals. Summing up, I want to say that if it is comfort and intimacy you’re looking for, this “uncharted” island will be right up your alley. With only a couple of locals and some tourists accompanying you on this trip, there will be plenty of romance and serenity for you. The beachside vibes and the occasional cows you’ll see on the streets will only add to the chilly and relaxing atmosphere of Gili Layar. All you’ll have to do is find the best route to get there. Wait, we’ve got it all covered in the next chapter! How To Find Gili Layar? Ok, this is the last thing we gotta take care of. Unless your name is Tom Cruise and you’re used to landing on tropical islands with a parachute, it would be wise to use a car/taxi to get to the closest harbor and then rent a boat and sail to your destination. The Tembowong Harbor will be perfect for that. From there, the tourists will be able to get to Gili Layar in less than 30 minutes. Or, they can just pay for a one-way trip – that will be significantly cheaper. From the Lombok Airport, the road to that harbor is 65-70 kilometers long and will take approximately 1 hour and 40 minutes to get there. From Mataram, the capital, the path is even shorter. In 1 hour and 20 minutes, the taxi drivers will drop you at Tembowong. Fact: you are more than welcome to rent a boat at one of the beaches in the big city and skip the land route. For the visitors that are chilling at the Senggigi Beach right now, everything is the same, except that they’ll have to drive/sail for a bit longer. Alright, now you know your way around Gili Layar and Lombok in total. I really hope you’ll have fun on this trip! Don’t forget that you can always rent a cool-looking bike and ride into the sunset. The best thing about Gili Layar - it's surrounded by other amazing islands. Feel free to sail around! Yes, that's right: Desert Point is THE place to surf. I'm not a pro but did have my fair share of fun. We got there from Bali. The first stop was the south-western corner of Lombok. Then we moved a bit to the east. Definitely a top-3 Gili for me. It's not only beautiful but also rewarding, meaning you can do pretty much anything there. In my opinion, Layar, Nanggu, and Meno are the best Gilis in Lombok. Check 'em all out when you get the chance.